Fortune today released its annual "Fortune 500" rankings of America's largest companies by revenue, revealing that Apple leapt 21 spots this year to land at #35 with over $65 billion in revenue. Apple climbed 21 slots into the top 50 of the Fortune 500 this year. How'd it get there? The company not only continues to expand its reach in existing markets, it also keeps creating new ones. Take the iPad, which showed the world the power of tablet computing when it was introduced last year. iPad 2 followed, and was one of the most highly anticipated electronic products this year. CEO Steve Jobs' appearance at its debut in March reassured shareholders worried about his most recent medical leave. Regardless of who's in charge, though, investors have plenty of reason to believe Apple's magic spell on consumers can continue. 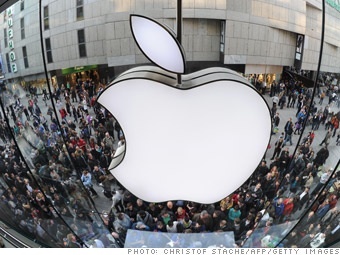 Apple's profits of $14 billion in 2010 also made it the 8th most profitable company, up from 26th place last year. In the Computer and Office Equipment category, Apple passed Dell in overall revenue to move into second place behind HP. Apple leads that category in profits by a wide margin. Apple was also cited as one of the seven biggest hirers of 2010, adding 12,600 employees during the year to reach nearly 50,000 total employees. Apple also leads the Fortune 500 in average annual investment returns over the past decade, averaging 45.8% annual growth. Overall, Wal-Mart repeated as the world's largest company with $421 billion in revenue, well ahead of second-place Exxon Mobil's $354 billion figure. Love the point about hiring. Apple haters should at least be proud that in a brutal global economy, there's at least one company adding jobs at a fast clip right here in the USA! Wow - who's Big Brother now? The Ipad is not Apple's secret to sucess. Their secret is being able to create markets for their products where no market previousely existed. That being said, the Ipad is a case in point. "We are the Borg. Lower your shields and surrender your ships. We will add your biological and ethnolocial distinctiveness to our own. The funny thing is that I remember a time when people used this quote to sneer at Microsoft. And there was a time when Apple was the underdog and created the 1984 commercial. Now with that tight iTunes/iOS control freak software, I doubt that they would make such a commercial again. Apple has become exactly what they were originally against. They are the establishment now, and the flock bought it hook, line and sinker. 2) Size does not mean quality - Proof by looking at the Top 10 list. So for the fanboys that are going to EQUATE increasing size with quality, you can't. That doesn't mean that Apple does or does not make quality products relative to the market. It just means that size has little to do with that. Size is about either about base need or conversely about marketing, resources, and time. And "Profitability" is about how high a price a company can set and get away with it because of supply being greater than demand or because they have sufficiently created a fanatical fanboy base that will accept a higher than rest of the market price for similar items. So if Apple is more profitable as a percent of revenues compared to similar companies, then they are charging us too much but are able to get away with it. Just like the oil companies and banks on the list. Quite possibly the most ridiculous post I've read in the past year. First of all, quality is ABSOLUTELY measurable and not subjective. TQM, Lean and Six Sigma, and numerous other scientific methodologies exist to measure product quality. At the lowest level, quality can be measured in return rates; and from what I've researched, Apple's return rates are exceptionally low (and customer satisfaction rates, exceptionally high). Apple = Quality. Secondly, profitability has nothing to do with "setting a price and getting away with it". It DOES have everything to do with lowering manufacturing costs due to volume, supply chain management, quality of design and return rate, and management of margins. The reason that Apple is so successful has nothing to do with "getting away with something"... It does have everything to do with excellent management of a business that builds highly desirable products for its customer base. Dude, don't venture into areas where you don't belong. The Mac was trying to create the market for GUI PCs, but it was swept from under Apple by Microsoft, even though Apple had a much much better product. The Apple TV... yeah that isn't working. At all. But the iPods dominated their market of portable mp3 players and from them comes the recognition and respect Apple has today in portable devices. The iOS devices are a huge success, but for every success story at Apple there are many more flops and near hits. The last similar success for Apple was the Apple II, which also became wildly popular in its market (it was just a very small market for PCs in 1977, unfortunately), but what is the secret to Apple's success? I don't know, but I suspect a lot of hard work and persistence is involved.